Leonids should peak at 4 a.m.
Back in the day (like 1833), the Leonids were the bee's knees of meteor showers. Sky and Telescope said the meteors fell "like snowflakes in a blizzard" with several dozen per second. The Leonids aren't as spectacular these days, but they should still produce an impressive display early Tuesday morning over the Washington region. Sky and Telescope said this year's crop of meteors should be better than average, with the peak coming at about 4 a.m. Tuesday. There could be 20 or 30 meteors per hour. 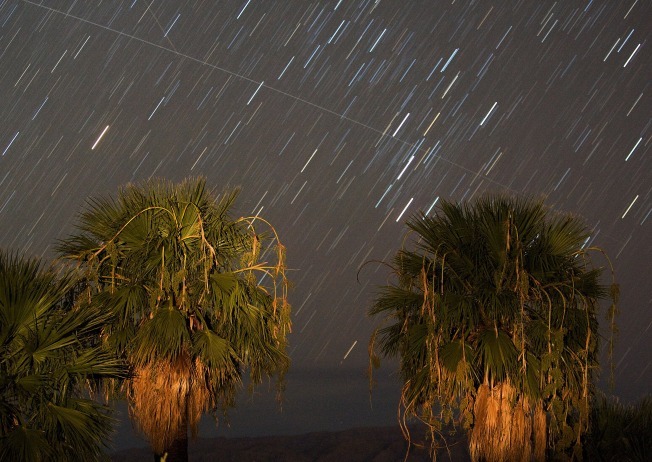 What will you need to spot the meteors? A dark location. City livin' isn't the best for stargazing, so "dark-sky" conditions are best to catch the light show. NBC4 meteorologist Tom Kierein said the skies will be partly cloudy that early Tuesday morning, so there's a chance to see a few streaks through the sky each minute. Where should you be looking? Up, for one thing. Sky and Telescope said to look wherever your sky is darkest. Notice the meteors' flight paths; only those streaking away from the direction to the constellation Leo are Leonids. Anything going the opposite direction is probably just a plane taking off from National.